Homeschooling was something we had never heard of before when a book arrived as an order mistake. The book was on homeschooling. I decided to keep and read it. Later we met a few families that homeschooled and were impressed by the character of their children. 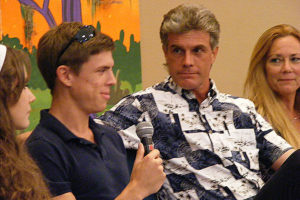 When our oldest child was a year old, we went to hear Gregg Harris. We met more homeschooling families. There were several years of prayerful investigation on our part. We looked into curriculum, legal aspects, and support groups. Above all, we sought God. What was His will for our family? We are very pleased that He led us to homeschool. Our family has benefitted tremendously from it! My journey actually began on a rainy night in February driving home from a track meet in high school. 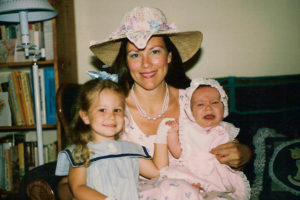 There were several surgeries, excruciating pain, sorrow and guilt over my friend Jenny’s loss. I saw, for the first time ever, myself as a sinner running my own life in my own way. I gave my sinful, broken heart and shattered body to Jesus. Suddenly my “great wisdom” seemed unable to help and I turned to the God revealed in the Bible for truth, counsel, and help. Although there was one month in a wheelchair, JESUS HEALED ME! He healed me completely! Three months later, I was on the drill/dance team again and definitely walking! With Jesus, came joy! I was amazed and filled with wonder that God would love me. Singing, kneeling, bowing down—there was not enough available to express my love for Jesus. I would sing to Him everywhere I went, often changing words to secular songs, making them love songs to my new King and Best Friend. The Bible was like a magnet. I read and read and read. And Bible reading often led to worship. I joined Bible studies, attended every church service I could and sought out like-minded believers. My heart burned for those I loved to know Jesus too. I talked to them about Jesus constantly through my senior year in high school and on into college. Soon I had the great joy and privilege of leading friends to Jesus, discipling them (helping them get grounded in the faith), and finally helping them to lead their friends to Jesus and start the process all over. What fun! I loved serving the Lord. This time period in my life not only shaped who I am, but also how I would homeschool. Like everything else in my life, homeschooling is a service to God in thanks for all He has done for me! College Years! In college, I read a book called The Master Plan of Evangelism by Robert Coleman. This book would give me a vision for making disciples that would affect my homeschooling in the future. The Lord also brought a handsome, godly young man into my life who shared my heart for the Kingdom of God, especially missions. We fell in love, courted throughout our sophomore, junior, and senior years, and married one week after college graduation! (My dad’s stipulation: graduate from college before you get married.) I didn’t realize then that we would be homeschooling our children in the distant future. I graduated with a bachelor’s degree in nursing and, following our honeymoon, we moved to Arizona where I worked with Native Americans. This degree in nursing required all kinds of chemistry and biology classes, as well as human anatomy. Teaching science to our children would never be difficult! Two years later, I was pregnant with our first daughter and began having excruciating pain in my previously injured hip. We went to the elders of our church who anointed me with oil and prayed over me and the pain left forever. Katie Beth was born completely naturally with no medication. Four more babies followed over the years the same way. God is good! I loved motherhood more than I ever imagined. I chose to give up my nursing career to be a full-time mommy. My mother, a children’s librarian, provided us with lots of well-written, beautifully illustrated picture books. We read and read and read and read! Our home education really began at birth with reading aloud together, a tradition that continues today! Katie Beth and Julianna filled my days with joy, wonder, and a very big mess to clean up every evening after they toddled off to bed. 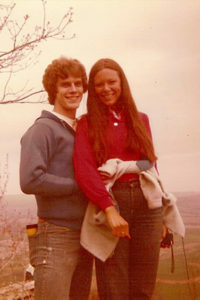 Mike was in seminary at the time, so we lived in student housing, an apartment complex belonging to Regent University. Each morning a school bus pulled up to pick up the children going to school. I watched other moms kiss their babies good-bye. However, as I watched my young neighbors get on the big yellow bus each morning and arrive home in the afternoon, exhausted with homework to complete, I felt sadness overwhelm me, realizing that my babies would grow up and go to school too. I didn’t want the teachers getting to spend time with my children all day. I wanted to enjoy the daily moments with them myself. Just as I had been there when they each took their first step and spoke their first word, I longed to see them learn to read, to add and subtract, and write their name in cursive for the first time. There was not a desire in my heart to protect my children from the big bad public school system, but to spend their childhood years with them all day instead of just a few cranky hours in the afternoon and early evening. The neighborhood school bus put a seed in my heart while my babies were very young. At the same time, I was beginning to meet homeschooled children and their parents. Their parents were ordinary, just like me. But the children were unlike any I had ever met before. These little ones were poised and polite, able to enjoy conversation with adults. 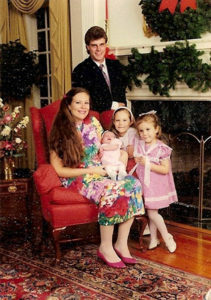 These homeschooled children showed genuine interest in my family. There was a kindness in their lives that attracted me. I found myself desiring to see my own little ones grow up to be kind, considerate, and gracious. Did homeschooling have anything to do with it? I had to know. As I examined the field of homeschooling in the mid-eighties, I found much diversity in the midst of some homogeneity. All the moms wore jeans jumpers and drove mini-vans, but beyond that, families were so different in their educational philosophy, style, schedule, and curriculum. Although I didn’t really like jumpers, driving a mini-van could be tolerated, so I began to pray about the possibility of homeschooling. Seriously, the lifestyle appealed to me and thus began a diligent investigation into homeschooling: reading books, looking at curriculum, and sitting in on some “school days” with my friends. Katie Beth Goes to School…at Home! In 1991, we began homeschooling with a Bob Jones first grade math book and a Sing, Spell, Read and Write kit. We spent an hour three times a week doing school. At the end of the year, the math book was finished and Katie Beth could read! She loved school and I came up with books for her to read. I wondered if she was really comprehending what she was reading when she began to read her first chapter book, Charlotte’s Web. When she came to me weeping because Charlotte had died, my question was answered. Julianna played at our feet while we did school and listened in when we read history and science books. School Continues… A few years later, Julianna joined her sister and started school. By now, I was pregnant again and falling asleep whenever I read aloud. “How about if I read the history book, so you can sleep,” Julianna would say in a serious tone, but with a grin on her angelic face. Julianna may have had an angelic face, but she was always up to something…like sprinkling baby powder into our moving boxes, or emptying all the perfume bottles in the house. Rose loved to swing back and forth in her baby swing, but she always wanted to join us for school. Many of the girls’ writing papers were ripped to shreds by their little sister, Jenny Rose. At this time, I began writing articles for my favorite homeschooling magazine, The Teaching Home. 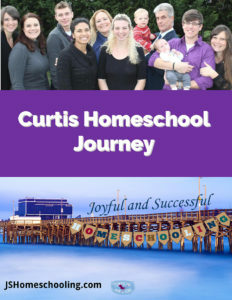 I continued to write several articles a year about our methods of homeschooling until Jimmy was born. A New State…Then Another New State! Mike graduated from seminary and we moved to Delaware for two months to spend time with my grandmother. Then we moved in with my parents for six months while Mike started a business in Central Florida so that we could plant a church. Although we were traveling up and down the East Coast, homeschooling continued without stopping. We built volcanoes, planted seeds, made Colonial Christmas wreaths, and read wonderful books aloud. Our beloved book collection was now growing, filling at least five bookcases! The two months we spent in Delaware with my grandmother will be treasured in the hearts of my older daughters for the rest of their lives. My grandmother, Beezie, was in her early nineties then, but still active and able to play dress-up and have tea parties with my daughters. Katie Beth and Julianna brushed her hair and would fix it “like a teenager’s.” They baked cookies, went on walks, and worked in her garden together. Although she would live to see her hundredth birthday, her health began to decline a few years after our two-month stay and she moved in with my parents. My older daughters carry memories of those months to this day and although we had “school” every day, things were learned those two months that were far more valuable than academics. We would never have had these precious memories and the freedom to move around if we were not homeschooling. 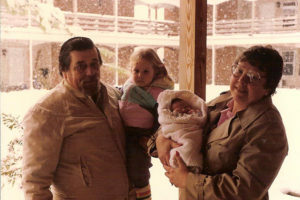 Likewise, the six months with my parents was a chunk of time in all of our busy lives to reconnect. Aside from this precious time, our lives were often so busy that quick weekend visits were about all we got to have together. What a blessing to eat dinner together every night with my parents for six months. We attended my mother’s church with her and became close to all their friends. Early Monday mornings, Mike would drive up to Central Florida to get his new business off the ground. He would stay overnight with my cousins and return home each Thursday night. Each day, Daddy went off to work and Mom went off to the library, leaving the children and me to settle into a daily routine. Schoolwork kept on without missing a beat. The great thing was that, for six months, we had a personal librarian, who brought us home books, videos, and more information than we could ever possibly use. Settling Down in Winter Springs….Planting a Church! Mike’s business was a success and we were able to purchase a home in Winter Springs where we unpacked and settled down into “normal life” in our own home. Within the first year, we began a Bible study in our living room that was the beginning of Powerline Church. 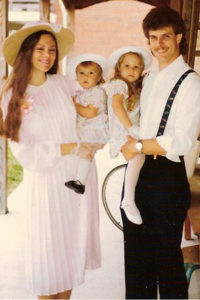 It was hectic and busy, compounded by the arrival of a baby girl, Sarah Joy, and then within two years a baby boy, Jimmy. Homeschooling continued. We joined 4-H and started cake decorating, sewing, baking, and public speaking, in addition to all our other activities. At this point, I joined a small support group in the area and enjoyed the fellowship of other women who educated their children at home. My children made new friends and life was good. Our home was full of activity, especially related to our little church plant. The little homeschool group disbanded and we joined a larger group, Grace Home Schoolers. When Katie Beth was twelve, she began attending Friday enrichment classes for junior and senior high students. All the rest of my children have enjoyed enrichment classes and co-oping with other families in high school. We Build a House in Lake Mary Jimmy’s birth created a problem for us since we were living in a three-bedroom house. Four girls could simply not share a small closet. We began house hunting. Finally, we decided to build a home in Lake Mary with five bedrooms and a study. The price was an incredible deal—a miracle from God! The builder gave us an estimated time for moving in and our home sold just in time for that estimated date. Unfortunately, the house was not ready. We ended up moving into a student housing apartment in Maitland (far away from everything in our lives!) for three months, putting most of our furniture in storage. It was an adventure. And homeschooling continued on without missing a beat. We wrote reports, went on long walks, made timelines, and drew maps of the world. As the school year ended, our house was finally finished—three months after the estimated completion date! We took the whole summer to settle in. We painted, wall papered, and planted flowers in the yard. By this time, our church was outgrowing our living room so we began meeting in Teen Challenge’s chapel. Several of the students there attended our services and eventually Mike began preaching at their church services also. Some of the graduates joined Powerline. 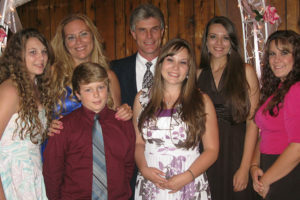 At the same time, a family we had known briefly in Virginia Beach moved down to the area and became part of our church. 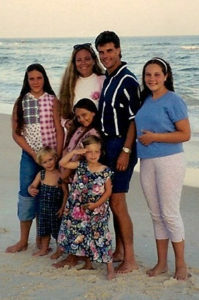 The Nolette family also homeschooled and our families became instant friends. We began to get together and co-op once a week. Fourteen years later, we still meet once a week for history, Bible, and music. Our families have celebrated holidays and birthdays together, as well as working hard together in Powerline Church. Two of the Teen Challenge graduates were looking for an apartment together and, as we all prayed, Mike and I sensed that they were to move into our home for two years to be mentored and experience healthy family life. There were strict guidelines for behavior; expectations were laid out. Now we were a family of nine, instead of seven. The boys both jumped into helping Mike with ministry and led a small group Bible study together. And homeschooling continued on. 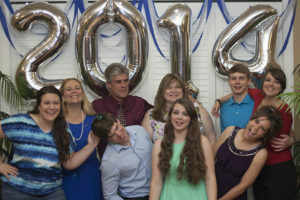 It was now time for high school and Katie Beth was my guinea pig, trying out a truckload of assignments and curriculum without a murmur of complaint. There were now four children being homeschooled and an active toddler ransacking the house. I would work with the younger ones, especially with reading, writing, and math. We continued to read aloud together, often with Katie Beth joining us briefly. We took many field trips to the beach or Sea World with the Nolettes the year we studied oceanography. During this time, I also joined the worship team at church. A year later, Mike asked me if I would take over as worship leader. I was scared to death at this new challenge. However, after six months, I felt like I had been born to be a worship leader and, today, leading worship is one of the great joys of my life. In 2001, Daddy was diagnosed with colon cancer and in the process of preparing for his surgery and chemotherapy, ended up having a double bypass on his heart and an aneurysm repaired. I made frequent, stress-filled trips to my parents’ home in South Florida. My mother was in a wheelchair from a diabetic infection in her foot and my grandmother was living with them too. 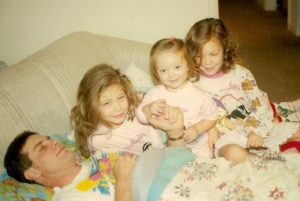 Many times I could only take the two or three younger ones and had to leave the older ones home to manage the house for a few days. Most of the time, I took them all. Through it all, we continued to homeschool. We took books to the hospital and I would give spelling tests in waiting rooms while waiting anxiously to hear the results of Dad’s surgery and tests. 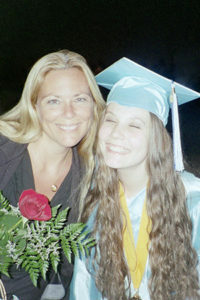 In 2003, Katie Beth graduated from high school. She was a National Merit Finalist and graduated with straight A’s. We participated in two graduation ceremonies. The first was a lovely service with Grace Home Schoolers where Katie Beth gave a dramatic reading from Our Town by Thorton Wilder. 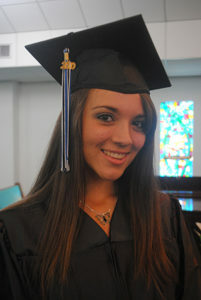 The second was with FPEA and Katie Beth was chosen to give the valedictorian speech for the state of Florida. We were so proud of her. In honoring Katie Beth, I felt that God was giving me a “thumbs up” and the encouragement to keep on going because Jimmy was now ready to start first grade. As Julianna started high school and Jimmy first grade, we continued to meet with the Nolettes, another homeschooling family, weekly. Our families decided to study history together each week on Thursdays. The first year we studied British history, something we had never studied in-depth before. We read aloud, listened to CDs, built castles, acted out Shakespeare, wrote poems, gave speeches, filled in maps, colored flags, decorated timelines, watched movies, and cooked yummy British food. We even had a British Christmas dinner complete with plum pudding and a goose. This tradition has continued. The second year was American history, then a year of ancient world history, followed by modern world history, and, finally, geography! We added singing and piano lessons to the day’s studies. In December of 2004, we celebrated my grandmother’s 100th birthday. It was a lovely celebration! It would be our last time to celebrate all together. During the summer of 2005, we were blissfully enjoying a much needed summer vacation when bad news made us pack our bags and head to South Florida. Dad had stopped breathing and was in the ICU on a ventilator. The doctors were asking Mom to pull the plug. We left our vacation condo on the beach and headed down to a very scary situation. We cried and prayed the whole trip down that God would spare my father’s life. We had to fight with doctors to keep them from pulling the plug. Eventually, we were able to see Daddy weaned from the ventilator and return home in a much weakened state. I spent almost all of the first month and half of the next three months down at my parents. My little ones were with me, doing school in hospital waiting rooms and learning all about lab test results, X-rays, and ventilators. They also spent time with my grandmother and my mom, building memories. November of 2005 saw my dad return home just in time for a terrible hurricane. That same month I broke my foot in a car accident and my grandmother went home to be with the Lord. I had to travel with a broken foot to South Florida for the funeral and to Delaware for the memorial service. After the memorial service, my mother had a mild stroke. A few months later a tumor was discovered in my abdomen and I underwent surgery. Thankfully, it was not cancer! In the midst of trials, we homeschooled on, rarely getting behind in our schoolwork. We supported one another emotionally and tried to look at the bright side of things. My children continued to teach Sunday school, sing on the worship team, and work with the teens’ ministry. My husband continued to pastor and I continued to lead worship each week. In 2006, we said goodbye to our oldest daughter, who went to Mexico to study abroad for a semester her junior year in college. We missed her terribly, but were excited for this opportunity for her to experience another culture and language first hand. She acquired more and more college scholarships as each year progressed, graduating with a little bit of extra money in the bank and releasing us from any financial burden. We celebrated my father’s 75th birthday with thankful hearts and two months later, my mother unexpectedly passed away. We were all shocked and saddened. She was only sixty-nine. After her own mother’s long life, we were reminded by God of the brevity of this life on earth. 2007 was filled with trips down to South Florida, cleaning out my family home, and eventually moving Daddy up to Sanford/Lake Mary area to be close to us. Throughout all the difficulties, we were surrounded by the love and care of our church family, many of whom homeschool. Julianna graduated from high school in May 2007; Katie Beth graduated from college the same month with a double major in English and Spanish. Julianna headed to Stetson University to major in Business. Katie Beth got a job with a publishing company to prepare for her future as a published author. Two down; three to go. Jenny Rose, a sophomore in high school, sang with me on the worship team, and attended Friday classes with Sarah Joy and Jimmy. We continued our tradition of “family night” each Sunday evening where we watch a movie, play a game, and enjoy being together. My older daughters chose to live at home and commute, rather than be close to college or work. They continued to invest in their younger siblings’ lives. Our children are best friends and have always chosen to spend time with one another, to tag along with one another’s friends. My children all took turns visiting their grandfather and building a closer friendship with him while he adjusted to life without my mom. During this time, we opened our home to another young adult. Her name is Aisha. She and her live-in boyfriend visited our church and got saved. They both moved in with families in the church and began to serve the Lord. Aisha has been like another sister to my children and a daughter to me. Homeschooling has been a tool, shaping responsibility and servanthood into our lives as a close-knit family. We are thankful for this wonderful privilege. As a young teenager, I could not have envisioned the life that God had ahead for me. How good it has been to trust Him at every turn. The Lord had always used our family to help other homeschooling families, but now He was bringing more and more into our life. “Can I see what you do with your children for high school?” my friend Bonnie asked. “Of course,” I replied, pulling out all the classes I had designed for my children. “Can I make copies?” Bonnie asked. “Sure,” I replied, handing her a large stack of folders and notebooks. Bonnie encouraged me to package my classes for other homeschooling families, so I began to write and blog more about homeschooling and to put materials up on a brand new website. People were asking me more about homeschooling high school than ever before, so I ended up joining two other veteran homeschool moms and we held a workshop at the local library. “Wow! That was a great turn out,” my husband said, walking me to the car. “Yes,” I replied, “But so many were asking the wrong questions.” I had begun to notice a horrifying trend of homeschool graduates being enticed by the world. I wanted to minister to the heart of homeschool parents, equip them to raise godly children. From this conversation, our Finish Well conference was born. We had the first Finish Well conference the summer of 2009. Unfortunately, just before this conference and a grand twenty-fifth wedding anniversary celebration, my father passed away. Another loss. It was so hard. As always, we pulled together and comforted one another. During this time, Katie Beth went back and got her master’s degree in English. Jenny Rose graduated in May 2010. I was terribly lonely when she started college in the fall. She and I had done everything together, from singing and working out, to writing songs and planning events. She sang a beautiful song at her graduation that she had written herself. Julianna and Jenny Rose commuted to college together where our dear friends Zack and Marla also attended. The four of thethem began to proclaim Christ at Stetson, sharing their testimony, defending the faith in classes, and preaching the Gospel. As Rose graduated, Shine began high school with Jimmy two years behind. Like their older sister, Julianna, Shine and Jimmy are strong leaders. They have given imput into the high school classes I created for them and take their relationship with God very seriously. Facebook, Twitter, and other online temptations have made homeschooling my youngest children more of a challenge. We have had to sit down and make plans to prevent distractions while they are doing school. It has been a completely different ball game from homeschooling the older ones. The years rushed by. Sarah Joy went through some challenging times during the first two years of high school, but Jesus got hold of her heart and she blossomed into a lovely young woman. 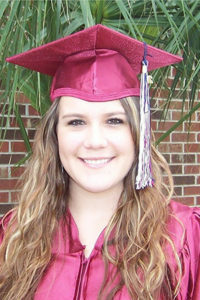 Julianna graduated from Stetson University with honors in 2011 (the Outstanding Student too!) and began working with computer systems at Aon Hewitt. Katie Beth graduated with her master’s degree and worked for several years at the University of Central Florida as an English professor. 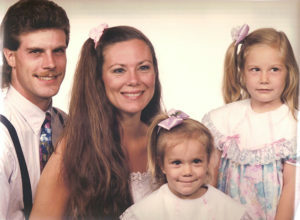 Like most moms, I have prayed for all of my children’s future spouses. 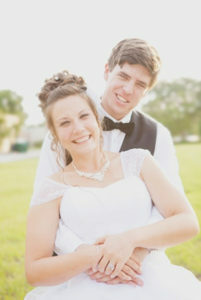 Julianna courted a young man, but after six months, they realized that God was not calling them to be married. However, another courtship followed. This time it was Katie Beth. The young man she was courting was the son of our dear friends, the Nolettes. Both families were delighted. We already loved Zack as a son so we hoped the courtship would work out. In July 2013, Mike and I taught several workshops up in Atlanta at the Southeast Homeschool Expo. We decided to have a family vacation. We would stay in a cabin in the mountains north of Elijay. We arrived Sunday afternoon. The following day, there was a knock at the door and a handsome young man in a suit gave Katie Beth a beautiful bouquet. The handsome young man was Zack. He had flown to Atlanta, rented a car, and driven to the cabin to surprise Kate. She was overwhelmed. Yes, she said yes when he proposed! Sarah Joy’s senior year was a blur of activity. There were senior activities, volunteer hours, wedding showers, wedding planning, and lots of shopping. Sarah Joy graduated in May with her best friend, Phoebe. 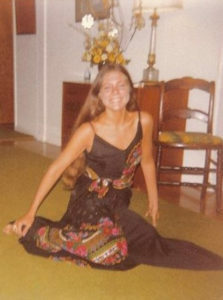 It was also Jenny Rose’s senior year in college. She graduated with honors from Stetson and was the Outstanding Student in both of her majors, Spanish and Communications. 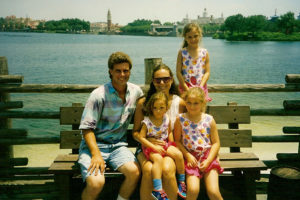 Later that month, we left on our final family vacation before Katie Beth got married. It was a bittersweet time, so full of excitement about the future, but such sadness that life goes by so quickly. On June 21, 2014, Katie Beth became Mrs. Zack Nolette in a lovely ceremony. They had their first kiss on their wedding day. After Katie Beth and Zack left on their honeymoon, Rosie painted Kate’s old room and moved in. As Mike and I headed home from another trip to speak in Atlanta, we got a phone call with the exciting news. Katie Beth was a few weeks pregnant. We were going to be grandparents! 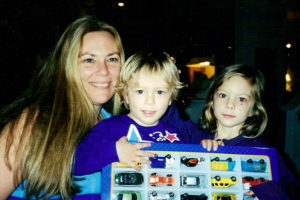 As I settled into homeschooling my baby (who, by now, was much taller than me! ), we had many visits from Katie Beth when she didn’t feel good. She would come over to watch old Brady Bunch reruns with me. Wasn’t it just yesterday that I was pregnant with her? My, how time flies. Did I mention that Laura and my “history days” ended up turning into a full-blown church/homeschool co-op? Well, it did! We had over fifty moms, babies, children, and teens meeting for various classes in our home! It was sweet chaos! Jimmy loved co-op and the Lord used it to grow him as a strong leader. It was awfully quiet with Shine at college, Katie Beth married, and the other girls at work. But Jimmy and I enjoyed those precious last two years of high school. Though his father disciple him weekly, he and I had many long talks about serving Jesus, dreams, goals, and personal stuff. Two months after Rusty arrived (what a privilege to be there for the birth! ), my baby graduated! 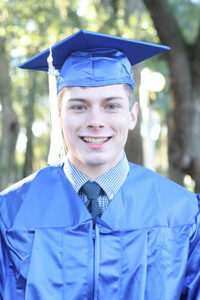 Jimmy gave an amazing graduation speech that was a call to wholehearted devotion to Jesus. I was thrilled! Graduation was bittersweet. I had run the race! But was I finished? Families at church begged Laura and I to continue the co-op and so we are still teaching at co-op and spending more time on our company, Powerline Productions. I am grateful for this season of life as Laura and I work together to bless and equip other families. Our life is busy, sweet, and happy. We see Zack and Katie Beth and our sweet grandsons often. Jimmy is a diligent college student working his way through college. Aisha is working at Chase and courting a godly young man. Julianna is working at Verizon and Jenny Rose is working at Charisma Media as an editor. Julianna and Jenny Rose work close enough together that they can grab lunch sometimes. Jenny Rose is courting a wonderful young man with a passion for God. We are thankful for God’s blessing on our family and homeschooling. And we look forward to the future! God is taking you on your own homeschooling journey. It will be an adventure! Enjoy it, trust in Jesus at every turn, and persevere! God is with you! With Christ, nothing is impossible!